Blacktip Island divemaster and amateur cartoonist Finn Kiick has published a serialized graphic novelette featuring a team of costumed crusaders on a small Caribbean resort island. Kiick said the The Adventures of The Slacker Defenders’ heroes and villains are modeled on people he has known in his years on Blacktip Island. “This’s a new breed of superheroes – pure Blacktip personalities,” Kiick said. “In most comics, a dude get mutated by some scientific snafu, right? Well, the Slacker Defenders’ve been torqued by living on a little island too long. Kiick’s superhero lineup features Scuttlebutt, Captain Barstool, The Mooch, STD, Backstabb and Mr. Brown Knows. 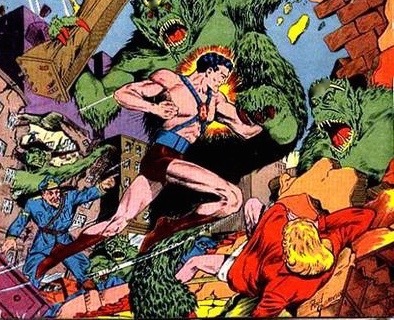 The first issue pits the team against its nemesis, the evil Dr. Speedo and his Pee Men. “It’s art copying life, really,” Blacktip Times book critic Paloma Fairlead said. “Dr. Speedo is a guy named Georgie from Passaic who morphs into the ultimate scuba diving evil whenever he steps into a dive boat’s head. Some readers have taken offense with Dr. Speedo, a pot-bellied villain who wears only the skimpiest of swimming attire. Others locals objected to what they see as the comic’s subversive subtext. “This Dr. Speedo’s set up as the bad guy for wanting to replace a weak revenue stream with a stronger one,” Eagle Ray Cove resort owner Rich Skerritt said. “That’s anti-progress. It gets folks riled at local businesses. We can’t have that. Kiick is unfazed by the criticism.